When clients desire additional interactions with their therapist above and beyond what is included in the monthly subscription, they are welcome to schedule a video or voice appointment with their therapist through the Snapclarity platform. 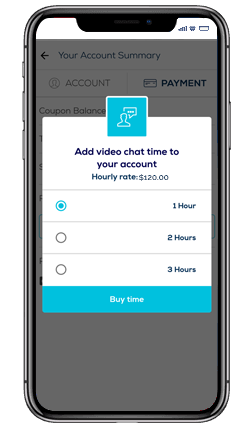 For voice and video appointments, therapists can set their own hourly rate and therapists receive 70% of their revenue for these additional video and voice interactions! During the informed consent, it is very important that therapists manage clients' expectations about text response frequency. This includes informing clients of the time they have available for texting each day and how often the therapists will be checking their text messages. Therapists should be careful to protect their own well-being and professional time. This may be difficult to manage in the beginning interactions, but over time, therapists will become more comfortable and confident explaining to clients the limits of their professional practice. During audio and video sessions, clients are notified when they are close to running out of purchased time. During this time, therapists could experience a delay in communication from the client. If the client decides not to purchase additional time we encourage therapists to close their interaction. Ideally this would be during the last minutes of interaction, but clients and therapist may also agree to close the session via predetermined method of communication like text or over the phone. In future iterations of the platform, we hope to make some of these processes more automated and to allow clients to purchase additional text time, so we ask your patience in the meantime!